Second Shooter Plus is a rock-solid, refined motion control system that packs tons of features into a tiny body. This Motion control unit is perfect for time-lapse, stop motion, interviews, VFX and much more. It is usually operated through the included controller, but for more granular control of your shot, you can connect an iPad, Mac, or PC. Mount it on a Cineslider for three axes of control, or add a FIZ unit to program a precise focus pull. For cameras under 10 pounds, this modular system is the gold standard of motion control. Add Second Shooter F.I.Z. for $50 per day. The Second Shooter F.I.Z. Add-on Kit allows you to add a CineDrive Focus/Iris/Zoom Motor to the Second Shooter Plus System. An additional controller and bridge cable will need to be added if you want to use F.I.Z. as a fourth axis. Otherwise, you can simply plug the adapter cable into one of the available ports on your Second Shooter / Second Shooter Plus Controller. With Second Shooter Plus’ SurgeTech™ feature users can take a normal 12V input into the controller and output at 24V to each motor, dramatically increasing available speed and torque. With dedicated directional axis buttons users can operate multiple axis simultaneously, such as pan and slide, for faster pre-programmed move setups and to operate multiple axis during manual moves. Second Shooter Plus has two expansion ports giving users the ability to connect to various external accessories such as the Digital Control Center, while at the same time being able to connect two controllers together in Bridge Mode. One of the biggest features continued with Second Shooter Plus from Second Shooter is Bridge Mode. By utilizing one of the available expansion ports, users can link two Second Shooter Plus controllers OR a Second Shooter Plus and first generation Second Shooter controller to have 6-axes available simultaneously. For current Second Shooter owners looking to upgrade to Second Shooter Plus, this is a fantastic way to incorporate their existing unit into a 6-axis advanced motion control rig where FIZ control can be combined with slide, pan and tilt for extraordinary motion control shots. Bringing the power & features of CineDrive’s kOS software to the smaller form factor of Second Shooter. From basic slider shots to unmanned, looping shots for an interview – Second Shooter Plus proves its place as an A cam or B cam. Setting up a complex time-lapse has never been so easy. With basic and advanced features, the intricacy of the move is up to you. Stop motion is made simple with Second Shooter Plus. Set up your key frames then simply advance through each position to achieve a flawless end product. Manual Mode is perfect for run-and-gun style shooting when precision still matters. It provides an easy interface that allows shooters to grab shots on-the-fly with non pre-programed motion control. Setup moves easily with two or three keyframes and let Second Shooter Plus do the rest. Need to edit? Tweak each key frame independently without having to redo the entire move. Second Shooter Plus utilizes the advantages of Kessler’s Magnalink system, keeping the controller and accessories, such as the MagPak battery system, organized via magnetic connection. Repeat moves easily and at different lengths of time to achieve basic visual effects shots. Compatible with the popular bulb ramping device, Ramper Pro. The low noise output of Second Shooter ensures that when users need to capture audio, they won’t also be capturing motor noise. Never forget your intervalometer again. Second Shooter comes with a built-in intervalometer. Simply connect the camera cable from your camera to the Second Shooter controller. The Second Shooter Turntable is an excellent feature for users seeking advanced panning shots, such as those used in product showcase videos. Control CineDrive’s focus/iris/zoom motors via Second Shooter Plus. Ensure a perfect composition with the built-in bullseye level. 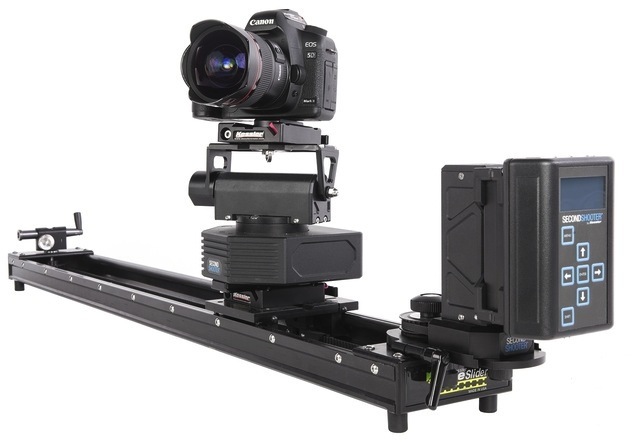 Rent the Kessler Second Shooter Cineslider Kit from Deck Hand Camera Rentals today!